Something fairly unique to Britain is our strangely unquestioning acceptance that places are haunted. Even people who aren’t superstitious in the slightest occasionally mention that their local pub toilet is frequented by a ghost, or that they think an angry poltergeist lives in their shed. It’s hard to know how seriously you’re supposed to take ghost stories, but I’ve decided it doesn’t actually matter . They’re fascinating, exciting and usually come packaged with lots of awesome local history – what’s not to love? So with that spirit (geddit) of open-minded interest, let’s have a look at the spookiest stories associated with the lovely Oxfordshire market town of Witney. In the olden days everybody was very religious and behaved well, right? Well apparently not, a local legend holds that a drunken Witney mob once murdered a priest in the middle of Bridge Street in the 11th century. As messy as Witney can get today, even the Red Lion never got quite that bad. The story goes that as a result, a particularly pickled gathering of angry Witney-folk descended upon the bridge over the Windrush, on what is now called Bridge Street. The bridge traditionally played a central role in the procession, as participants would normally float flowers in the water with blessings and prayers. On this evening though, the crowd vowed to smash up the bridge unless the church reversed their ban. It is said that a pious young priest did his best to talk them down, and was hurled to a watery death as a result. HE’S A PRIEST. DROWN HIM. In the years since, there have been several reports of a ghostly priest-shaped corpse floating in the waters. The sightings tend to take place at 8pm, on the third day after Easter – if any of you can take a photo, I’ll buy you a pint. Minster Lovell is a lovely village to visit in its own right, but it are the still-impressive ruins of Minster Lovell Hall which really deserve a look-in. It was the home of the powerful Lovell dynasty, a family that once held a position of great authority in England. Francis Lovell (1454 – 1487ish) was a close personal friend of Richard III, and formed a central part of Richard’s court. He followed his King in a military expedition to Scotland in 1480, and fought alongside him in the Wars of the Roses – the civil war that would eventually lead to Richard’s death and the rise of the Tudors. Francis Lovell’s whereabouts after the catastrophic defeat at The Battle of Stoke Field (1487) aren’t fully known, but in 1708 renovation work found a corpse walled up inside a hidden room in the hall. Local folklore holds that this was Francis Lovell, hidden for years, fed by a faithful servant until he died, leaving Francis to a foodless fate. There have been numerous reports of a ghostly knight riding towards the hall – it’s not clear who this knight actually is, but as it fits Francis’ story so well, it is easy to suppose that this is a ghostly re-enactment of his return from the battle. The other famous story attached to the hall is that of the ‘White Lady’. Apparently, in the mid-1700s the wedding of a young William Lovell was held in the hall. After the ceremony, some of the guest suggested a game of Hide and Seek. The young bride had the clever idea of hiding in a large chest in an attic, but found that it locked upon entry. I wouldn’t look so smug if I were you. It took two years for the game to come to an end, when her entombed corpse was finally discovered. The story was popular one, with Victorian poet Thomas Haynes Bayly immortalising it in a song, The Mistletoe Bough, performed here by the wonderful Jon Boden. In the bridal wreath of the lady fair. “A few years back some friends and I drove over to Minster Lovell ruins at about 1am. We sat down on the grass behind the ruins watching over the river just chatting and laughing. Suddenly though, my eyes were drawn to the woods across the river. I stayed silent and watched as a white figure glided through the trees. I have to say, if I starved to death somewhere, I probably wouldn’t choose to hang out there for eternity. Each to their own I suppose. 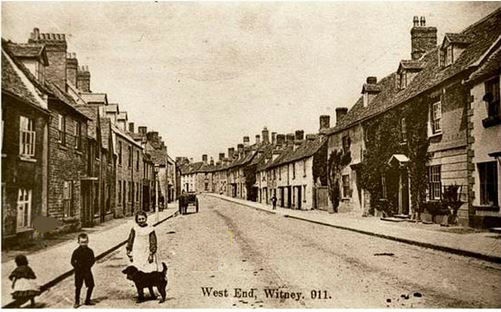 West End – The Most Haunted Street in Witney? As interesting as these nuggets of history are, it’s the paranormal aspect of the street we’re focusing on here. The building that was (until a couple of years ago) the local Post Office had actually spent most of the last century as an ale-house, named the Jolly Tucker. The building might be empty now, but a young woman, believed to be to a landlord’s wife, haunts the stairs up to the first floor. In fact, the pub’s landlady in the 1940s would reportedly have one-way conversations with the phantom when they passed each other. A married couple, who wish to remain anonymous, told me of a bizarre meeting they had with a ghostly visitor in West End. In the house on the left, where the street meets Hailey Road, they were sleeping soundly one night. For some reason though, the female member of the couple woke up, and as she looked around the room she saw a figure cloaked in white standing over her husband. The weirdest part was that this figure seemed to be pretending to cut his hair with its fingers, and when she gasped with fright, the Phantom Haircutter turned around and walked out of the room. They also mentioned that since leaving the property, they’ve noticed that it keeps going on sale. Perhaps they’re not the only ones to meet this trainee barber from beyond the grave? Google Streetview has yet to include a haunted house feature. Shame. Me as a toddler, reacting to events. If you happen to live on West End and have spent your time there in ghost-free happiness, I’m sincerely sorry if this has freaked you out. Just keep the lights on all the time – then you’ll be fine. There’s nothing funny to be said here, it’s too damn creepy. If you happen to be driving that way and you spot a damp looking young lady, perhaps you should run her over instead. Although if you end up killing an actual person, please don’t bring up my advice in court. Whether you’re a sceptic or believer, ghosts are intrinsically fascinating, especially when you’re living in Oxfordshire, the county often declared the ‘most haunted in Britain’. So Witneyites, next time you feel a bit odd, keep an eye out – you never know what could be lurking.